This book came at a time when I really needed to hear the message it held. God is pursuing me. He loves me. I'm not up for grabs. I am loved. I am His. I was made in His image. I am precious to Him. I am spoken for. Oh how I needed to hear that. This book is told from both Robin and Alyssa's point of view. The reader goes back and forth between both women, like you're listening to their conversation. It's super easy to understand and pick up who is saying what. 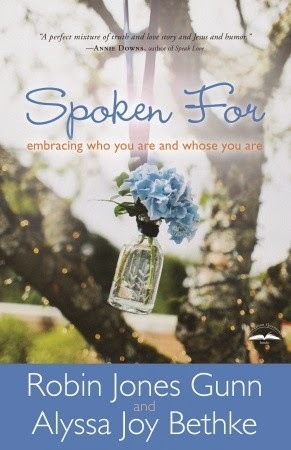 The main purpose of this book is to tell women that they are deeply loved by God. It's easy in our society to forget that. We get rejected, lose our self worth and get wrapped up in things that don't really matter. Before we even realize it, we've lost our focus. We can easily become consumed by worldly things, hoping they'll fill the gap, but truly only one wants to fill the gap. This was an amazing book. It's soul lifting, spirit rejuvenating and each chapter you walk away feeling like you were created uniquely. I think any woman, no matter her age, can relate to the need to feel loved, or wanted, or called. This is an easy-to-read, more simplistic format that everyone can enjoy. And with each chapter ending with reflection questions, it could easily be adapted for a small group study. You can visit Robin's website HERE and Alyssa's website HERE to find out more about them.